This article by Shawn Tribe was originally published in October of 2008, and republished in 2013. He and I recently noticed that all of the photographs, which were originally linked from an external source, have disappeared, so I thought it might be nice to repair it and reprint it again. It is listed here under my name, but still entirely Shawn’s work. Occasionally we get requests -- inspired by our series and descriptions upon different elements of liturgical vesture and ornament -- to discuss particular ornaments in greater detail. 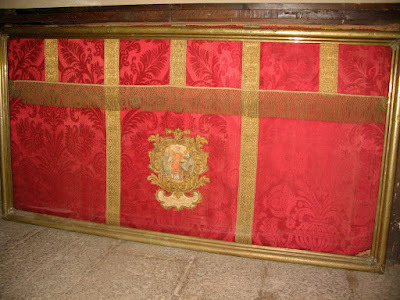 One such request was a discussion of the altar frontal, otherwise known as the antependium or pallium altaris. 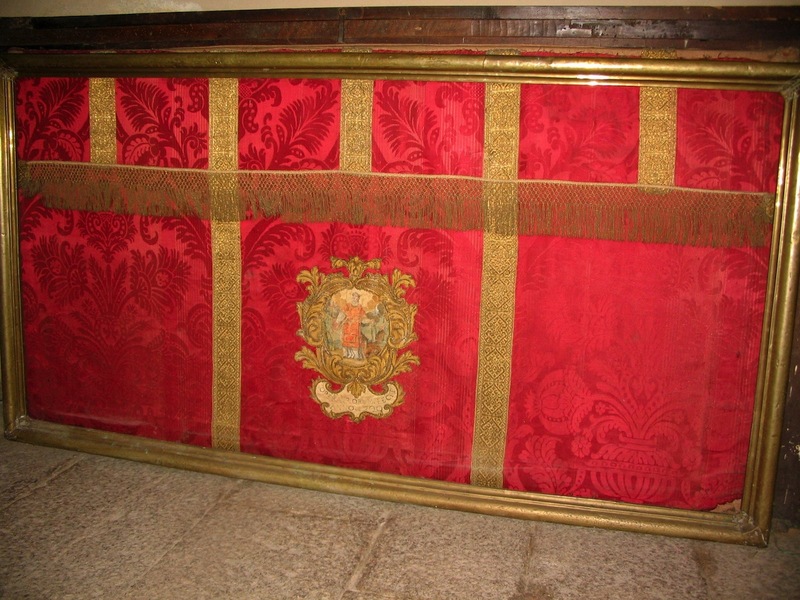 The Catholic Encyclopedia suggests that the origin of the antipendium might be “traced to the curtains or veils of silk, or of other precious material, which hung over the open space [NLM note: or “confessio”] under the altar, to preserve the shrines of the saints usually deposited there” which later developed into the altar frontal we now know. 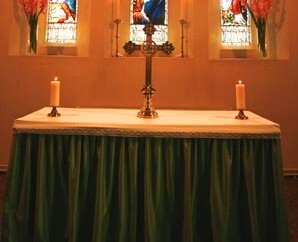 While the altar remained cubical in form, the ‘throw-over’ type of pall continued in use... this linen cloth, known as the Palla corporalis, was thrown over the altar, much as an ordinary table-cloth is spread today, by the deacons, and it fell down around all sides of the table. 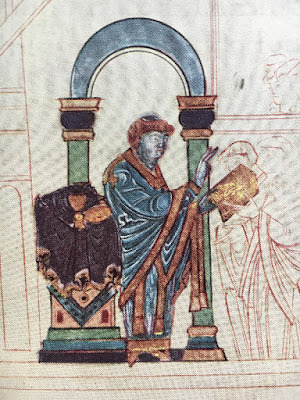 But in the Gothic period, when the altar tended to be lengthened, two things happened: (a) the linen pall became divided into two parts, one part being a long strip which covered the top of the altar and fell down over each end of the mensa, while the other part became the ‘corporal’ which covered the elements; (b) the silk pall becomes the antependium or frontal covering the front elevation of the altar only when it stood close to a wall or screen. 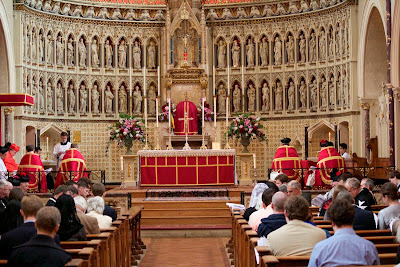 But it should be noted that where the longer type of altar was free-standing a ‘frontal’ was provided for both back and front. 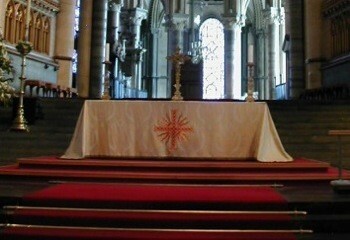 It was during the middle ages that we begin to see the vesting of the altar match the colour of the vestments of the day. 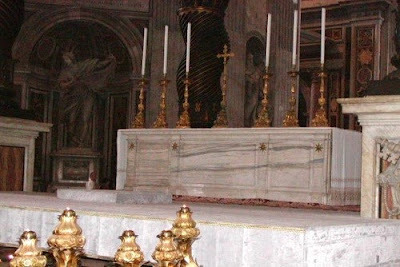 A visual comparison of the altar of St. Peter’s Basilica, unvested and vested, might serve to illustrate the visual and liturgical difference a frontal can make. The NLM has often appealed to clergy to consider re-instituting the use of altar frontals in their parishes and apostolates. It is to be hoped that these descriptions of the history and symbolic and liturgical value of the frontal will serve as further inspiration. 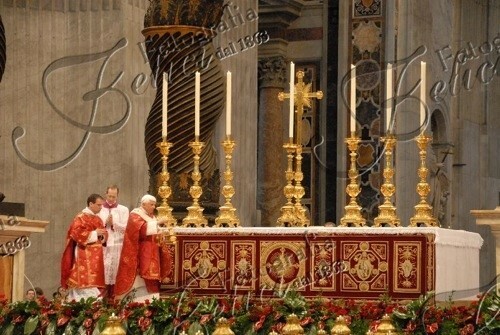 Let us consider a few examples of what I would deem unsuccessful attempts at altar frontals. There are a few problems here. 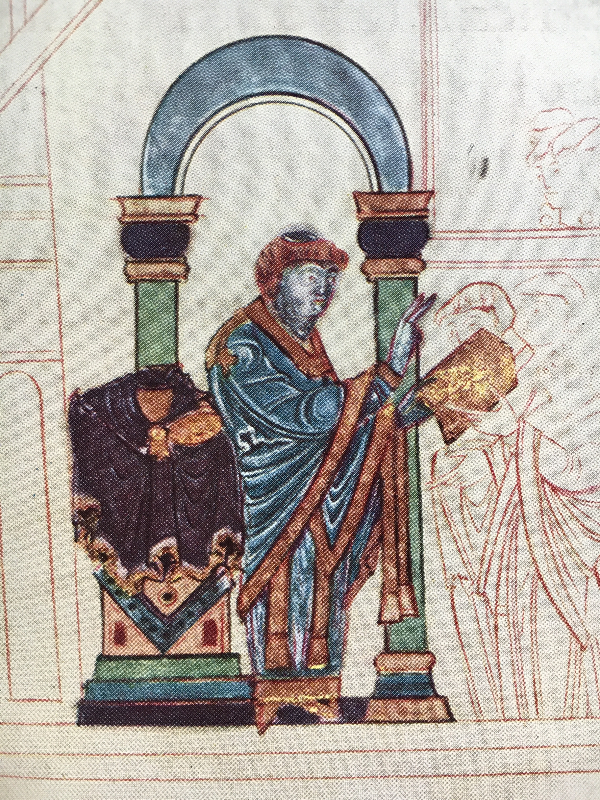 First, the use of a single colour without other ornamentation or orphreys. But worse is the use of pleating which takes away from the altar itself and approximates not so much paraments for the altar as curtains before it. This frontal’s ornamentation is rather plain and could be much improved by being weighted better and by including a greater vertical dimension in terms of its decoration. Two different forms of a kind of “superfrontal” which only partially covers the altar. 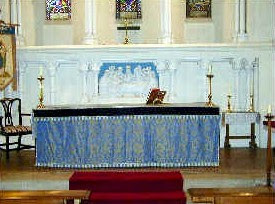 The former might also be manifest by the use of a Jacobean style altar linen in which coloured strips are hung down in front, over part of the altar. 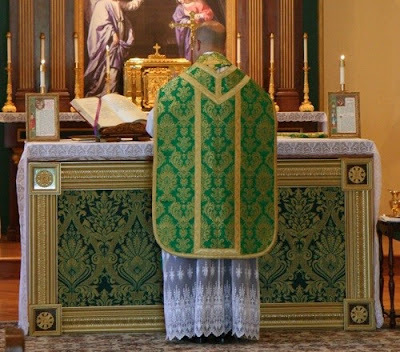 While both are quite neat, neither of them seem to accomplish the dignified vesting of the altar, nor create the focus upon the altar that a full frontal accomplishes. 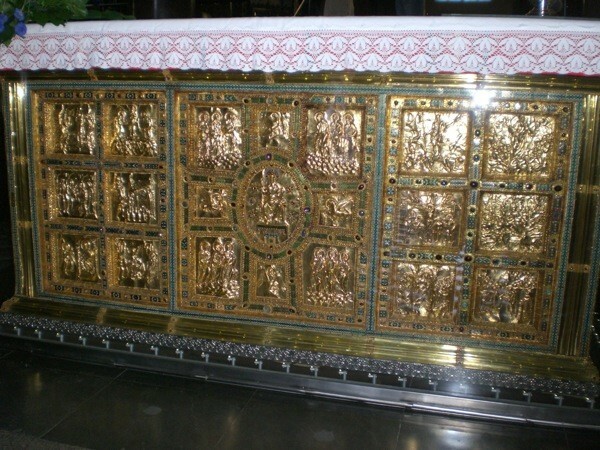 This form, which finds itself draped over the entire altar, certainly approximates some of the earlier form of the altar covering discussed in this history, however, this form of frontal seems to lack the neatness and elegance of the frontal as it developed. It must also be remembered that the original forms related to the cube shaped altars of the earlier Church and not to the longer altars that developed. 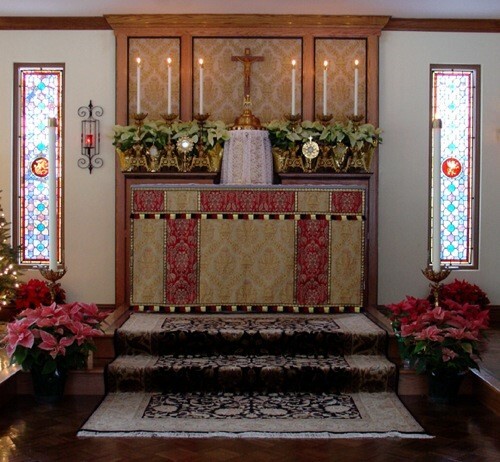 Now let us compare the former examples with altar frontals that better serve to vest the altar in a dignified manner, drawing attention to it and to the liturgical seasons. I have tried to include stylistic variations to show the range of possibilities. 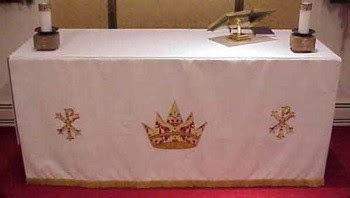 While I imagine there will be some disagreement about some of the principles behind the comparison of what is successful and what not, my ultimate hope is that this exercise might serve as the basis for a more considered approach to the altar frontal in a way that gives thought to their purpose and how they might be most liturgically dignified and effectual. [...] The frontal is best made of some textile -- because it is part of the clothing of Christ -- brocade, tapestry, velvet, silk, damask, etc. ; or more simply for lesser days, or in small churches, with orphreys of silk, or with braid or fringe. Designs should be bold since the frontal is viewed from a distance. In the traditional Roman frontal the material is divided vertically into panels (generally five) by narrow strips of braid; across the frontal (about one-fourth of its depth from the top) is a deeper strip, and the upper part of the frontal above this is divided into twice the number of panels (normally ten) by braid or galloon. The frontal may be adorned with woven or painted figures or scenes, or with suitable symbols (e.g., of the Blessed Eucharist). 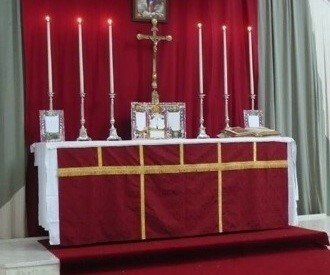 The frontal must cover the entire front of the altar. 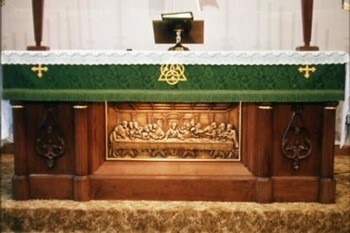 It may be fixed on to a wooden frame (telarium)... which slips into a groove under the table of the altar [NLM note: I have also seen peg like objects which the frontal inserts into and then it further tied to the sides of the altar with to hold it tight against the altar; this is the case at Ss. 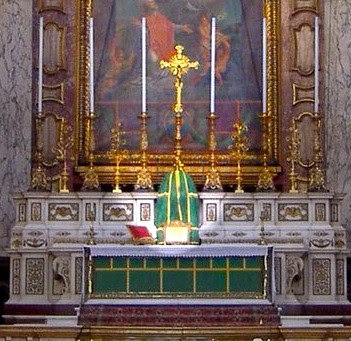 Trinita in Rome]; or it may hang, by small rings, from a rod, supported on metal lugs in the front elevation of the altar. 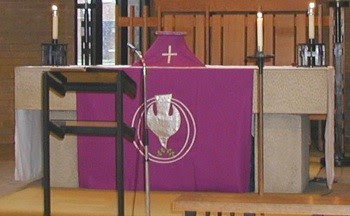 The rod and its attachment are concealed by a frontlet [NLM note: or “superfrontal”; it is the short but long rectangular piece that hangs across the top foot or so of the front of the altar, also the section which was referred to above as having double the panels of the lower half; this is the arrangement at the chapel of Merton College, Oxford]. It is sometimes desireable to back a frontal with some heavy material, like strong canvas, to get it to hang well.